I cannot believe summer is over?!?! Well, it feels like the end since I’m preparing to send my first child to Kindergarten on Wednesday. How can my sweet little 7 lbs 9 oz baby girl born the-quickest-five-years-of-my-life ago be going to Kindergarten? Please tell me I’m not the only mama out there struggling with the mixed emotions related to sending their first to Kindergarten. Yes, she is SO ready and SO excited BUT all-day Kindergarten? She’ll be at school and away from her family most of the day AND who knows what she’ll be exposed to. Oh, my mommy-heart is going to break a little when I drop her off on the first day. I’m walking into a whole new world. School schedules, teacher conferences, packed school lunches, homework (do they give homework in Kindergarten? ), and I’m sure lots of grumpy days ahead of adjusting to an earlier wake-up time (probably more from me than my daughter). This is where I need to up my organization game. I’m already excited about adding some of my fun, healthy lunch options like my Apple Fruit Sandwiches to her lunchbox. Oh, quick sidebar… I found this awesome insulated lunchbox along with these slim lunch ice packs if you’re searching for some great lunch boxes for your kids. Outside of packing her delicious lunches, I want to make sure my breakfasts for her are on point. I need my daughter confidently walking into her Kindergarten day with a belly full of nutrients. I strongly believe none of us can BE our best selves or DO our best work if we’re not treating our bodies the best. Here is where I introduce you to my copycat Jamba Juice Aloha Pineapple Recipe. Have you had Jamba’s Aloha Pineapple Smoothie? It’s creamy and citrusy with a hint of strawberry and the perfect remedy for holding onto the remaining Summer days. 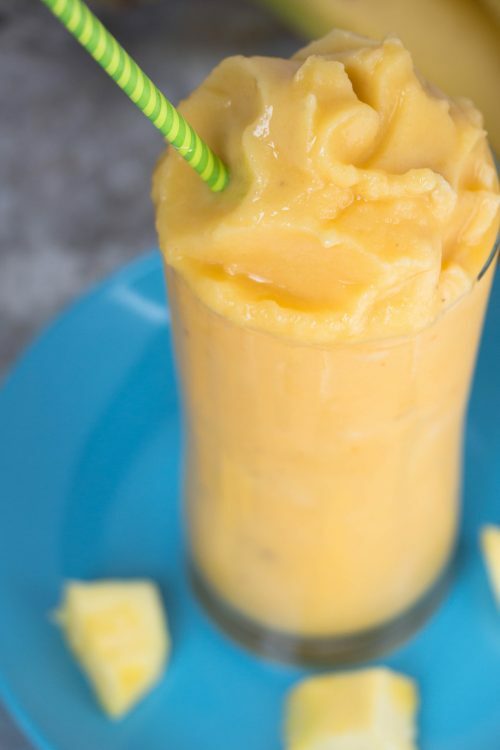 Since I’m not patient enough to drive to Jamba Juice every time I want one of their smoothies, I’ve played around and created a few fabulous copycats to curb my cravings such as Caribbean Passion and Mango-A-Go-Go. If you want to become smoothie obsessed such as I, a good blender is an absolute must. Actually, you need an excellent blender. I have a Vitamix and love that baby. I don’t think I ever actually put my Vitamix away since it’s always drying on the counter after being used and washed. I have several people mention they’re intimidated by the price, however you can find great prices on a refurbished Vitamix on Amazon. One, two, three… Team Vitamix!!! Okay… I’m done for now. 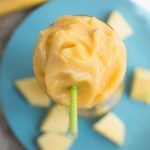 Back to the creamy Aloha Pineapple Jamba Juice recipe… My greatest tip is to always have frozen bananas on hand. Bananas are inexpensive and necessary for the creamy texture. Whenever I go grocery shopping, I buy at least two yellow hands of bananas (‘hands’ referring to 5-6 cluster of bananas… yes, it’s the right term. I just asked Google AND Google’s never wrong, right?). When I get home from the store, I immediately peel 5 to 6 bananas and place them single layered in a ziplock bag. Make sure to get out as much air out of the bag as possible and then transfer to flat surface in the freezer. It takes at least 5 to 6 hours for the bananas to freeze. 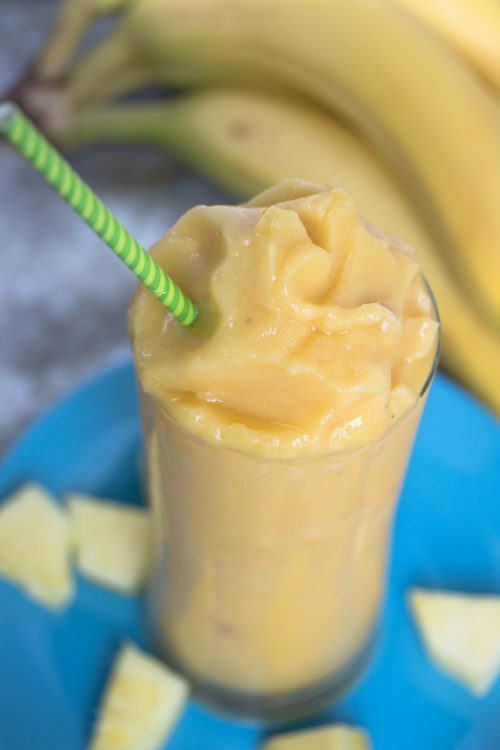 This smoothie will be either a pick-me-up in the morning for breakfast, a mid-day treat, or dessert after dinner where no one suspects it’s actually healthy. Aloha and enjoy! 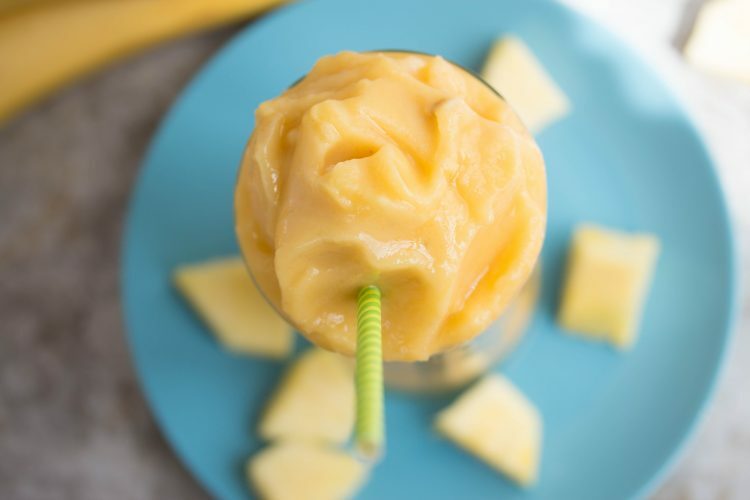 Who doesn't love the pineapple, citrusy goodness of Jamba Juice's Aloha Pineapple smoothie? This simple, 4 ingredient recipe will bring Jamba Juice right to your own kitchen. 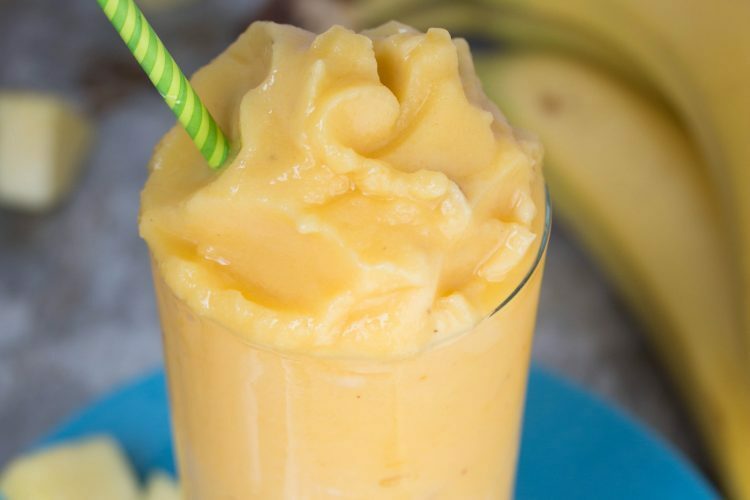 Frozen bananas are an inexpensive way to add creaminess to smoothies without using dairy. Make sure to always have a hand of bananas (5-6 bananas) frozen so you'll be ready at all times to blend up a smoothie. The bananas need to be yellow. Simply peel the bananas, place in ziplock bag in a single layer, and freeze 5 to 6 hours on a flat surface in the freezer. Pineapple is one of my favorites! It is very healthy when someone feels favor. But I never made juice from pineapple. So I am gonna make this! I hope you enjoy it! 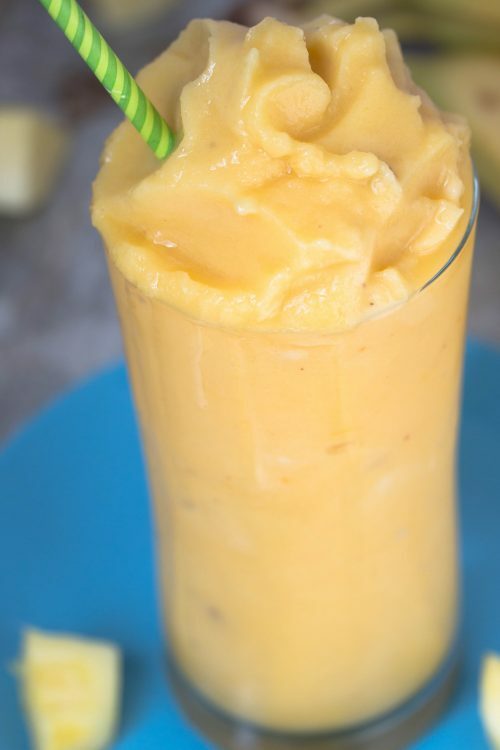 It’s one of my most favorite smoothies!